UFO SIGHTINGS DAILY: Giant UFO Hovers Over Mt Etna, Sicily, Italy On June 18, 2016, Photo, UFO Sighting News. Giant UFO Hovers Over Mt Etna, Sicily, Italy On June 18, 2016, Photo, UFO Sighting News. 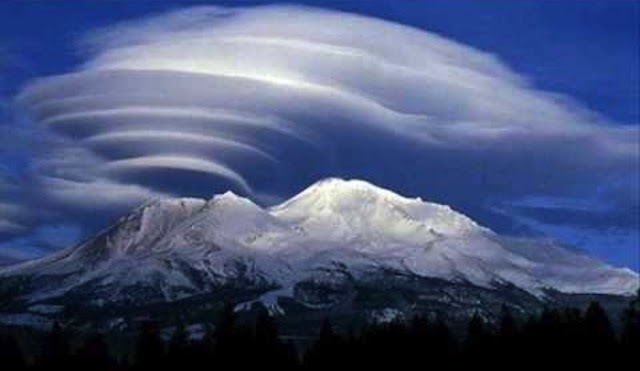 Here we have a UFO cloaked in a cloud, but the UFO is lowering from the cloud to the mountain, and it makes another disk cloud every time it pushes downward. UFO bases are often below oceans, mountains and volcanos because its the one place on Earth humans really don't want to be. Aliens can fool most of the people most of the time, but they sure as hell can't fool me. Thats a cloaked UFO over that mountain...probably dropping off supplies and people. A mysterious cloud, which appeared like a UFO, was seen hovering over Mt Etna in Sicily Italy on June 18, at around 4:50 pm. Due to its shape, residents mistook it for a UFO, with numerous people reacting with amazement. The massive cloud appeared as if suspended over the volcanic mountain raising alarms to the residents of Sicily, Italy who assumed it was alien-like. Images posted on other sites show a big lenticular cloud hovering on top of the mountain. (More at source).